Wire post fences generally aren't normally attractive landscape features and are in fact generally pretty intrusive and actively avoided but on this occasion it takes centre stage as the lighting and conditions quite literally demanded it. 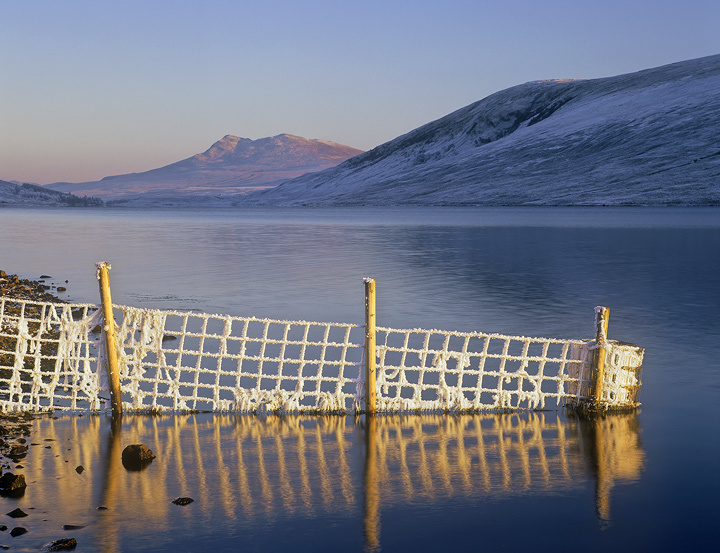 Low angle sunlight has stained the thickly rimed and frosted fence gold which stands out wonderfully against the soft blues of the still loch mirroring a clear blue sky. The mountain beyond gently glowing red is the only other feature receiving direct sunlight albeit faintly.